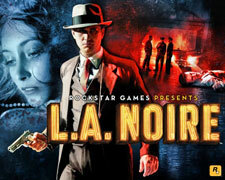 Rockstar Games announced on its website downloadable content (DLC) for its new crime drama game L. A. Noire. Beginning today and continuing on through the summer months, several standalone cases, collectibles and challenges will be released via PlayStation Network and Xbox LIVE, including all of the pre-order exclusive unlockable bonus content as well as a free downloadable weapon. You'll also be able to purchase the L.A. Noire Rockstar Pass as a method for pre-ordering and purchasing DLC. For a limited time only, it is $9.99 on the PlayStation Network (PSN) and 800 Microsoft Points (MS) on Xbox LIVE. Coming June 21st is "Nicholson Electroplating" Arson Desk Case ($3.99 PSN / 320 MS Points) and on July 12th, "Reefer Madness" Vice Desk Case ($3.99 PSN / 320 MS Points). L.A. Noire is available on the PlayStation 3 and Xbox 360.